Rely on the experience of the Sea Foam tech experts to help you with the most common, time-tested recommendations for using SEA FOAM SPRAY to clean gasoline induction systems. 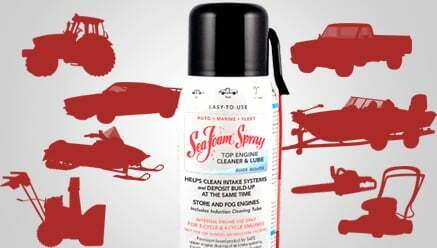 Where should I apply Sea Foam Spray to my gasoline engine? For 2 and 4-cycle INJECTION systems, spray continuously into the throttle body using Sea Foam Spray’s Hook Guide and Induction Cleaning Tube. For 2 and 4-cycle CARBURETOR systems, remove the air filter and spray into the carburetor throat using the Induction Cleaning Tube. INTAKE treatments require engine warm up, tube placement, product application, hot soak and drive description. Please refer to easy-to-follow instructions on the can. When STORING engines, using Sea Foam Spray to fog intakes and spray cylinder cavities will lubricate and protect chamber parts from dry out and corrosion. How much Sea Foam Spray do I use to clean my gasoline engine? When cleaning gasoline auto and truck intakes, use the entire can contents. When cleaning small engines, use 1 ounce to 1/4 of a can. Smaller carburetor engines usually require a series of spray bursts (not continuous) to stay running while cleaning. You will get better results when you also use with Sea Foam Motor Treatment in your fuel – The more Sea Foam you add to fuel, the better it cleans! Sea Foam Spray only contains petroleum-based ingredients and CANNOT HARM your engine. We recommend treating each gasoline engine you own at least one time per year. How will Sea Foam Spray help my engine? Sea Foam Spray is designed to deliver a high concentration of petroleum cleaning solvency into areas where gasoline fuel additives cannot reach. Sea Foam Spray works to clean carbon deposits, sticky gum and varnish residues from intake systems, intake valves, pistons and combustion chambers. Sea Foam Spray cleans and lubricates throttle plates, bushings, and upper cylinders. When fogging gasoline engines for storage, Sea Foam Spray helps clean, lubricate and protect internal engine parts from dry out and corrosion.